The KSA with the help of Austro Engineering and National Edging held a coffee morning at Grass in Montague Gardens. The aim was to address the problems experienced in the industry when it comes to edging and adhesives which seem to increase with the onset of winter. •	An edge-bander should be purchased from a reputable company offering full after sales service whilst ensuring the edge bander selected fits your company’s requirements and budget. •	Trained staff is the key to a quality finish - not the edge banders capability. It is suggested two staff members are fully trained as edge-banding operators. •	Ensure quality raw materials including edge-banding adhesives and edging are used as this will reflect on the final finish. •	As a manufacturer take ownership of machinery, ensuring that regular maintenance is carried out. Take care of your investment. •	Some older edge-banders can be retrofitted and updated with substrate cleaning and buffing systems like the Riepe system. •	Various edge-banding adhesives are formulated for specific edge-banding applications, therefore it is imperative that the correct adhesive type is selected for the correct application For example high-speed edge-banders run with hot melt designed to operate at higher temperatures with faster set rates than that of a contour edge-bander that operate at lower temperatures with longer open times. •	Slightly filled or unfilled hot melt adhesives offer a higher yield than filled hot melt with an invisible glue line and reduced maintenance costs. •	Glue pot temperatures not maintained at the correct temperature to suit the glue characteristics may result in the glue either burning or not adhering to the edging. If for any reason you need to change your glue, please ensure that your glue pot is thoroughly flushed and cleaned before adding new glue. Mixing brands and products may lead to changes in the chemical make-up which once again will affect the final finish. •	Where are you storing your materials?? It is suggested that your board and edging be stored at room temperature 18°C. Whilst most South African factories do not have temperature controls as they do in Europe, it would be suggested that your board is stored in the warmest part of your factory. The fitting of pre-heater bars, infra-red heaters or hot air blowers to the edge-bander can also be used to pre-heat the board edge prior to edging. Your machinery supplier will assist with this. We also suggest edging material is stored in a temperature controlled room. •	Ensure pressure settings on your edge bander correspond with the thickness of edging being applied. Without correct pressures; the hot glue is unable to transfer from the board to the edging to create a suitable bond. •	Ensure pre-milling, trimming and scraper blades are kept sharpened and regularly maintained. •	Never overfill the glue pot or allow the glue level to drop too far. Refill at regular intervals maintaining a constant level. •	Note where the edgebander is positioned. Avoid open doors, drafts and overhead fans. Changes in ambient temperatures will affect glue performance. •	Store glues correctly. Ensure the glue bag is properly sealed or alternatively store glue in airtight bins next to the edgebander and correctly labelled with the glue make and glue code. This to ensure wood dust, wood chips and edging chips do not contaminate the glue, causing unnecessary charring of the glue in the pot whilst reducing adhesion capability. •	Avoid the use of aggressive solvents to clean the surface of the edged board. This may weaken the initial bond. There are formulated release agents and cleaners commercially available for this purpose. In conclusion the KSA recommends manufacturers strive to maintain machinery and equipment, store stock correctly and ensure staff training is on-going. Small problems taken care of timeously will eliminate big problems occurring in the future. 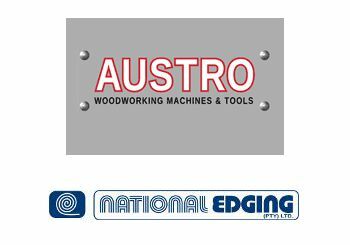 Thank you to Austro and National Edging for supporting this initiative.